Cardamom Spice | Culinary Uses and Health Benefits of the Queen Of Spices! Facts About Cardamom Spice - The Undoubted, Undisputed "Queen of Spices"
For centuries folks have been harvesting and using the enigmatic cardamom spice (Elleteria cardamomum) in a variety of ways in their cooking and for its many medicinal benefits. 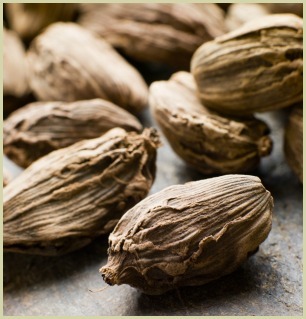 There are historical texts dating the use of these aromatic pods and seeds to at least 4000 years ago! From curries to cookies, coffee to meatballs to ice cream, or whether you're using the white, green or smoky black pods and seeds, this is definitely a versatile ingredient! From the ancient Egyptians and Romans, to the Vikings, from India, Nepal to Guatemala, it has a long and well travelled history. Today you'll find the bushy cardamom plant growing wild in the rainforests of southern India where the pods, due to their delicate nature, are still painstakingly hand picked, sorted and dried in the sun. This is the way people have been harvesting it for millennia. This backbreaking work is the reason it can be quite expensive. Don't let the price put you off, however, as a little of this most pungent of spices goes a long way! Note: When buying, please don't buy the pre-ground powder. Once ground it quickly loses its potency and flavour, so buy the whole pods and grind them yourself. The flavours and aromas are sooo much better!